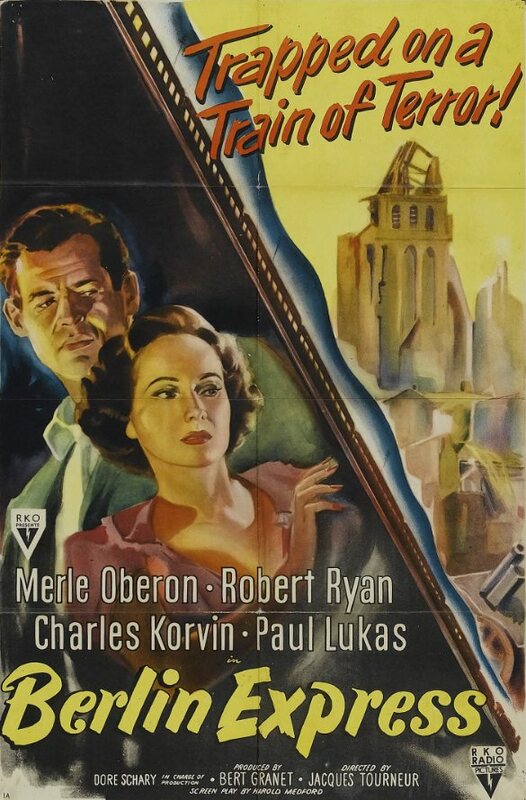 Jacques Tourneur’s Out of the Past is the greatest film noir ever made, but no one knew it at the time. All of this is a good thing, of course, since self-consciousness can kill art. 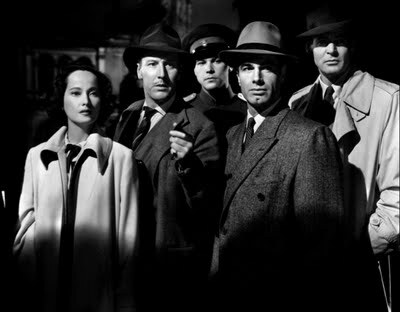 If filmmakers in the ’40s and ’50s had deliberately tried to make films with all the elements that the French were praising, they probably would have produced ham-fisted junk that was as unwatchable as most of the “neo-noir” that littered multiplexes in the ’90s. In his November 26, 1947, review of Out of the Past, curmudgeonly NY Times critic Bosley Crowther had a lot of good things to say about the film, and praised the dialogue and acting, but admitted that he couldn’t make heads or tails of the plot. This is a fair criticism, since the plot of Out of the Past still confounds first-time viewers, and most second- and third-time viewers as well. Note, for instance, the number of reviews of the film that claim the story is told mostly in flashback, when the flashback portion of the story actually occupies less than a half hour of running time, and from the 40-minute mark onward, the film takes place entirely in the present. 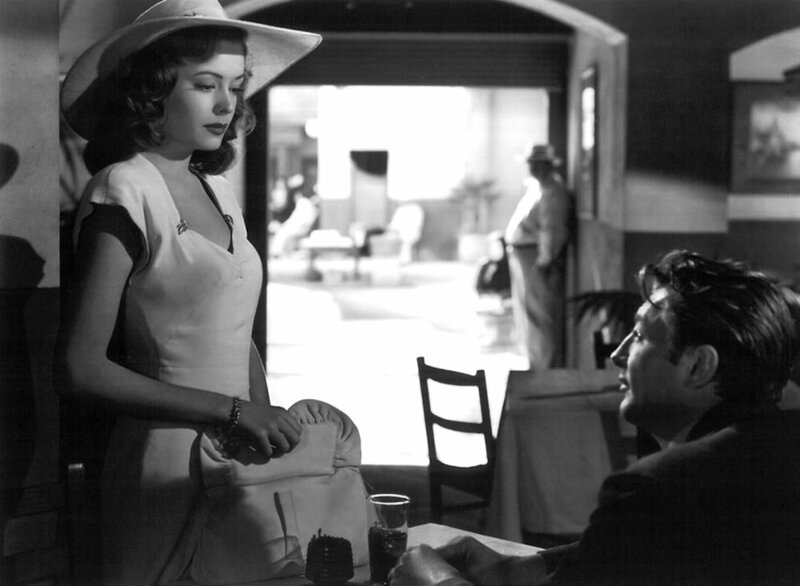 But time has been kind to Out of the Past, and a perfect understanding of its plot isn’t a prerequisite for enjoying every gorgeously filmed minute of it, since it’s packed with everything that makes a noir a noir. 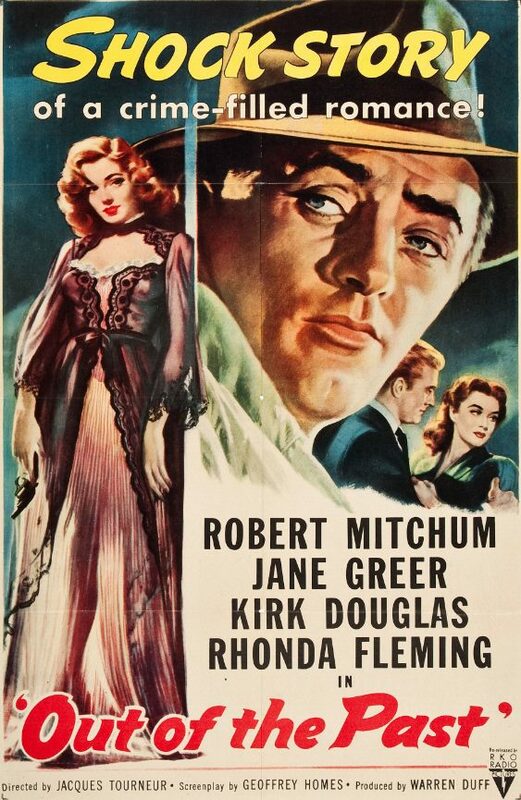 Its male protagonist, Jeff Markham (Robert Mitchum), is smart and tough, but ultimately helpless when faced with the seductive charms of the film’s femme fatale, Kathie Moffat (Jane Greer). 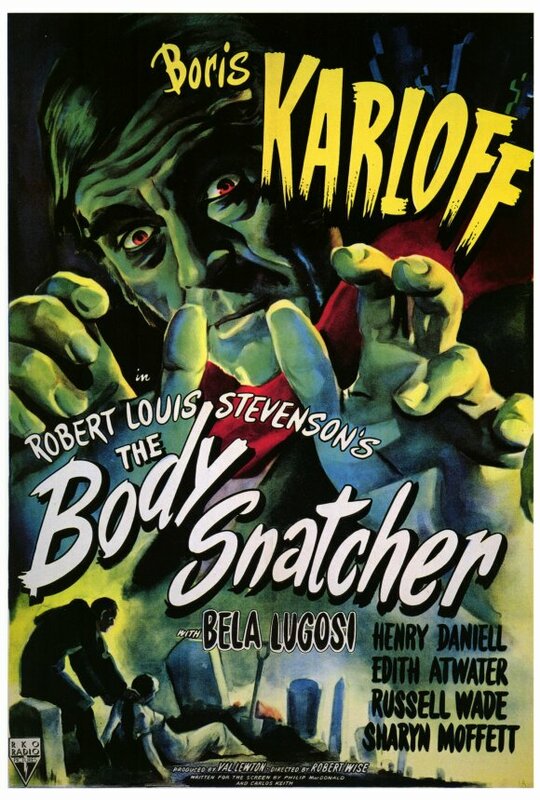 The film contains murders, swindles, frame-ups, crosses, double-crosses, triple-crosses, gambling, a large chunk of stolen money, a tragic ending, and some of the most seductive chiaroscuro cinematography of all time. The plot can’t really be summarized in a nutshell, but I’ll try anyway. While driving through a one-stoplight California town called Bridgeport, which is 79 miles south of Lake Tahoe, Joe Stephanos (Paul Valentine) pulls into a service station owned by Jeff Markham, who’s living in Bridgeport under the name “Jeff Bailey” and trying to forget his tawdry old life by going fishing every day with a nice girl named Ann (Virginia Huston), which her boyfriend Jim (Richard Webb) isn’t too happy about. Joe tells Jeff that Whit Sterling (Kirk Douglas), his old employer, wants to see him in Lake Tahoe. So Jeff spills to Ann. His real name is Markham, not Bailey. Three years ago he lived in New York and worked with an oily gentleman named Jack Fisher (Steve Brodie). They were detectives. They got a call to see a big operator, a gambler named Whit. His girl had shot him with his own .38 and taken off with $40,000 of his money, and he wanted her back. The money, too, but mostly her. Jeff took off on his own, leaving Fisher behind, and followed Kathie’s trail to Acapulco, Mexico. As soon as he saw her, he was hooked like a fish. In voiceover, Jeff recalls his romance with Kathie in Acapulco. I never saw her in the daytime. We seemed to live by night. What was left of the day went away, like a pack of cigarettes you smoked. I didn’t know where she lived, I never followed her. All I ever had to go on was a place and time to see her again. I don’t know what we were waiting for. Maybe we thought the world would end. Maybe we thought it was a dream and we’d wake up with a hangover in Niagara Falls. I wired Whit but I didn’t tell him. “I’m in Acapulco,” I said. “I wish you were here.” And every night I went to meet her. How did I know she’d ever show up? I didn’t. What stopped her from taking a boat to Chile or Guatemala? Nothing. How big a chump can you get to be? I was finding out. Kathie swore to Jeff that she didn’t take Whit’s money, to which he responded, “Baby, I don’t care,” and kissed her. Jeff and Kathie ran off together and headed for San Francisco. Things went swimmingly until he was spotted at the racetrack by his old partner Jack Fisher, who would turn him and Kathie over to Whit in a heartbeat for the payoff. Despite Jeff’s best efforts to lose the tail, Fisher eventually tracked him and Kathie down. When Jeff and Fisher started trading blows, Kathie coldly shot Fisher, then took off. Jeff never saw her again. He was left to bury Fisher’s body in the woods. He also found a deposit slip for $40,000 in Kathie’s purse, confirming that she’d lied to him about the money. The rest of the film takes place in the present. Jeff meets with Whit at his palatial getaway in Lake Tahoe. Kathie has returned to Whit, and he now knows everything about Jeff’s betrayal of him. Exacting a kind of payback, Whit forces Jeff to go to San Francisco to steal income tax records from the crooked accountant — Leonard Eels (Ken Niles) — who helped him hide his money from Uncle Sam and who’s now demanding $200,000 hush money. Jeff is supposed to get to Eels through his beautiful secretary, Meta Carson (Rhonda Fleming). But it quickly becomes clear to Jeff that he’s being set up as a patsy, and that Whit’s people are going to kill Eels and make it look as if Jeff did it. Ann, the good girl in Jeff’s life, can’t believe that Kathie is as awful as he makes her out to be. “She can’t be all bad, no one is,” Ann says. “Well, she comes the closest,” Jeff responds. And he’s right. Kathie is a murderer, a thief, and a liar. She’s completely and utterly faithless, but Jeff keeps falling for her. Every time she calls, he comes running. He can’t help it. He hates himself for it, but he can’t stop. I first saw Out of the Past when I was 17, and I’ve seen it many times since then. It took me several viewings before I got a handle on exactly what was going on in the film, but I always felt that its byzantine plot was part of its appeal. Even if you can’t figure out exactly what’s going on or who’s doing what to whom (or why), Out of the Past is still a seductive and brilliant film. 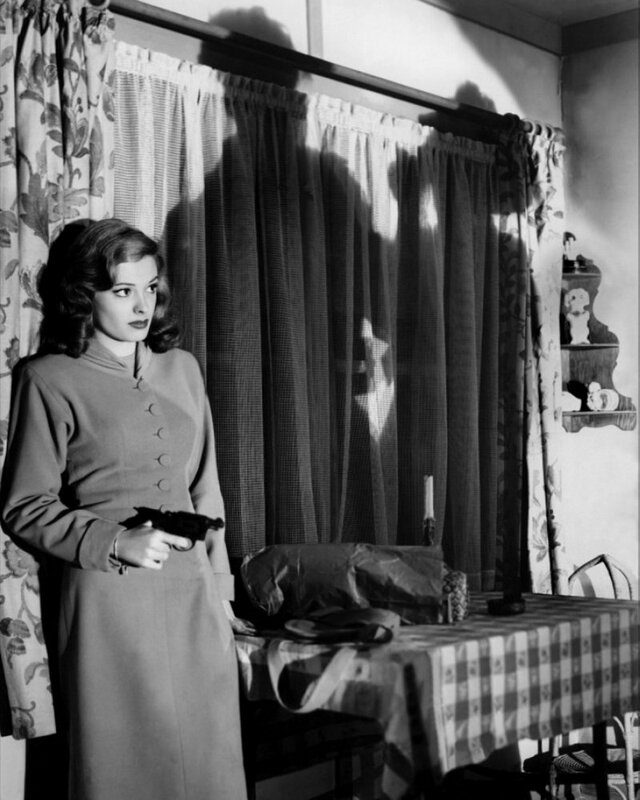 It’s the Platonic ideal of a film noir. Posted in 1947, November 1947 and tagged Film Noir, Jacques Tourneur, Jane Greer, Kirk Douglas, Rhonda Fleming, RKO Radio Pictures, Robert Mitchum, Virginia Huston. Bookmark the permalink.